Menu settings: In general, you should not change the Menu settings. The Blog module creates a specific area where all blogs are stored. Using the Menu Link Title and Parent Item creates a link to just this specific blog entry, not to your entire blog. Revision Information: If you want to make changes just to this blog entry but want to keep the old version, use Create New Revision. URL Path settings: Allows you to specify an alternative URL for your blog entry. Comment settings: Decide whether you want to allow comments, and use these settings accordingly. They apply to just this blog entry, not all. Authoring Information: Your name and the time and date are automatically populated. If you have several people contributing to the same blog, you can customize each entry here. 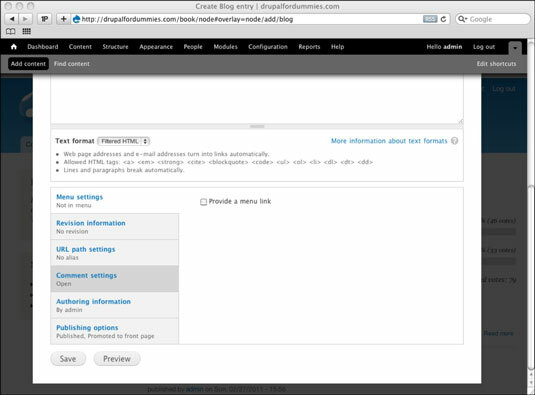 Publishing options: These control where this single blog entry will appear. With the possible exception of Revision Information, it’s a bad idea to use these settings very often. Blog entries should be consistent — and when you change the settings for one, you have an entry that no longer fits in with the others. Instead, you should change the overall configuration of your blog.